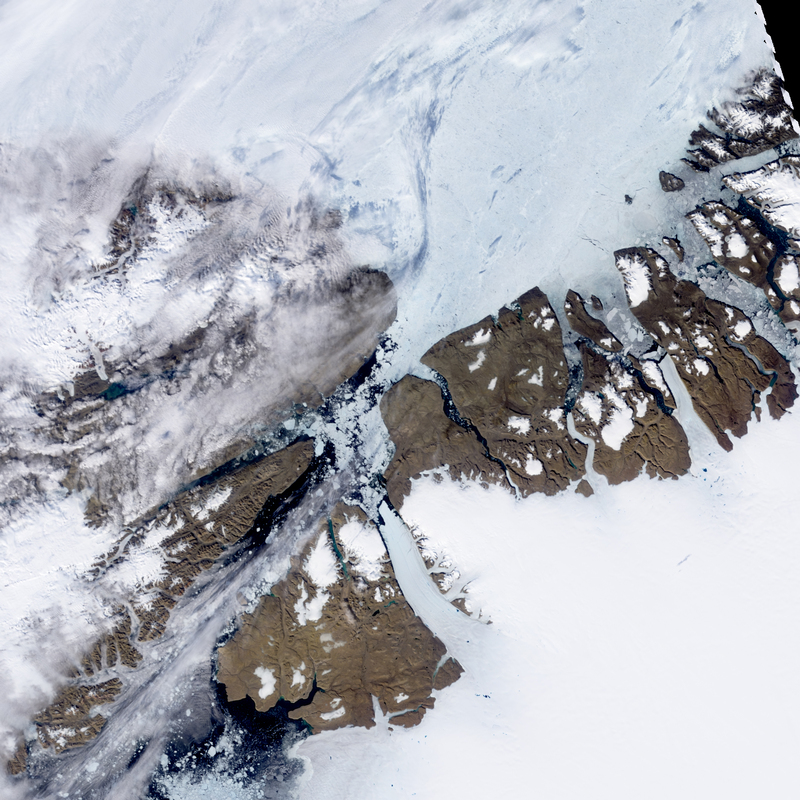 On August 5, 2010, an enormous chunk of ice, roughly 97 square miles (251 square kilometers) in size, broke off the Petermann Glacier along the northwestern coast of Greenland. The Canadian Ice Service detected the remote event within hours in near-real-time data from the Moderate Resolution Imaging Spectroradiometer (MODIS) on NASA’s Aqua satellite. The Petermann Glacier lost about one-quarter of its 70-kilometer- (40-mile-) long floating ice shelf, said researchers who analyzed the satellite data at the University of Delaware. 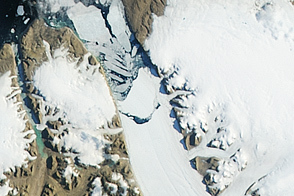 The Moderate Resolution Imaging Spectroradiometer (MODIS) on NASA’s Terra satellite captured these natural-color images of Petermann Glacier 18:05 UTC on August 5, 2010 (top), and 17:15 UTC on July 28, 2010 (bottom). The August 5 image was acquired almost 10 hours after the Aqua observation that first recorded the event. By the time Terra took this image, skies were less cloudy than they had been earlier in the day, and the oblong iceberg had broken free of the glacier and moved a short distance down the fjord. The large iceberg breaking from the Petermann Glacier serves as a reminder that ice sheets are dynamic, says Robert Bindschadler, Senior Research Scientist at NASA Goddard Space Flight Center. A glacier is like a relatively slow-moving river of ice. 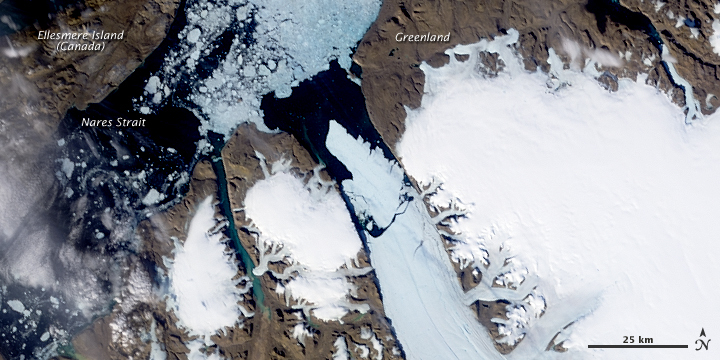 When a glacier flows into the ocean, as the Petermann Glacier does, ice breaks or calves from the end, creating new icebergs. “Calving is a natural process,” Bindschadler explains. How frequently icebergs calve from a glacier depends on how fast the glacier grows because of new snow, how fast it flows into the ocean, and how fast it melts. “Changes in calving will happen as climate changes because the environment changes,” says Bindschadler. Ice breaking from the Petermann Glacier doesn’t necessarily herald big changes on the Greenland ice sheet, he adds, but it does provide one more piece of data to help scientists understand how the ice sheet is changing as a whole. The event is also a reminder of the usefulness of satellites in monitoring our planet’s health. “We know what the ice sheets are doing because the satellites provide us with the data,” Bindschadler observes. NASA Earth Observatory image created by Jesse Allen and Robert Simmon, using data obtained from the Goddard Level 1 and Atmospheric Archive and Distribution System (LAADS). Caption by Holli Riebeek and Michon Scott. 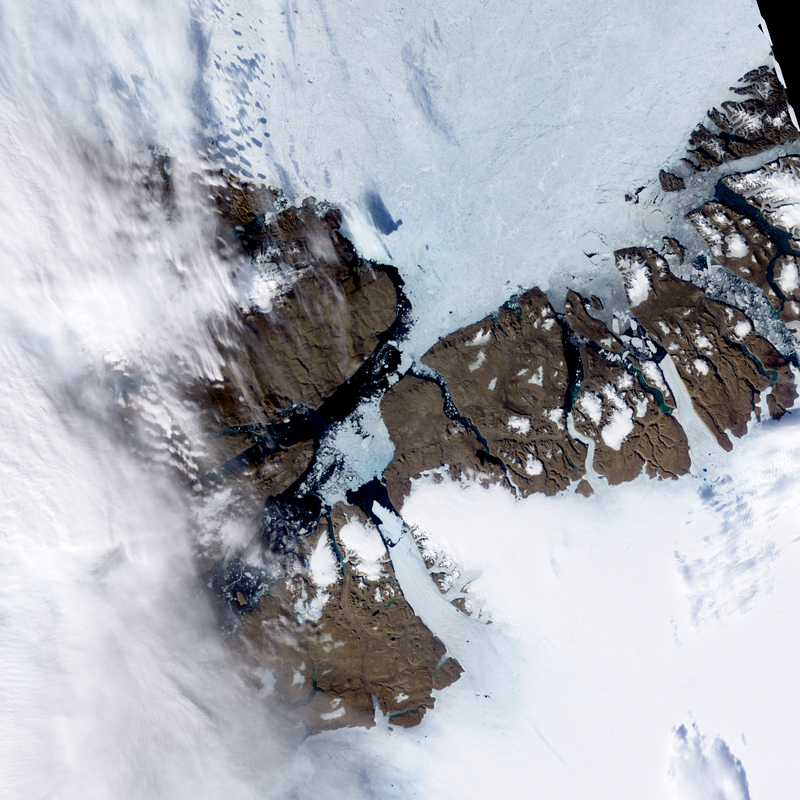 Acquired August 5, 2010 , and July 28, 2010, these natural-color images show the Petermann Glacier before and after the calving of a massive iceberg. Scott, M. (2008, September 12). Crack in the Peterman Glacier. NASA’s Earth Observatory. Accessed August 9, 2010. University of Delaware. (2010, August 6). 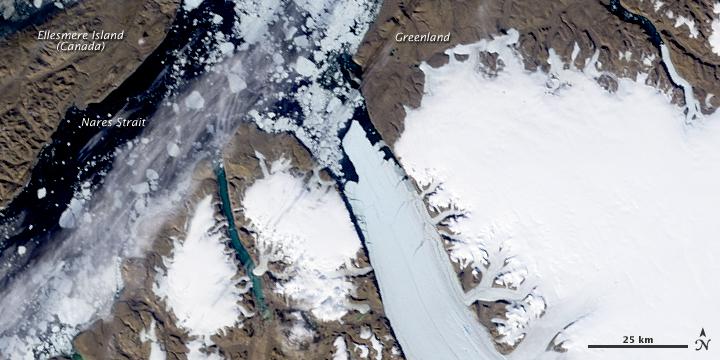 Greenland glacier calved island 4 times the size of Manhattan, UD scientist reports. Accessed August 9, 2010.